Pets, the latest addition to the Learner�s Library range, is a fantastic reference CD designed especially for young children. Information is presented using video footage and photographs that focus on different pets. 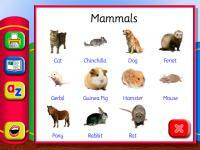 The types of animals kept as pets, what to feed them, how to look after them and more is all covered and searchable through menus, indexes and an in-built search facility. Two different levels of text for each entry are provided and information can be retrieved through the menu, index or search facility. With information presented in an easy-to-understand format, the pupil also has access to a scrapbook facility for making notes and a spoken glossary to help with difficult words. 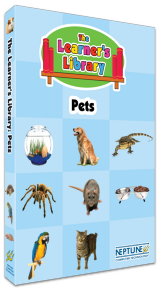 As with the rest of The Learner`s Library range, the title also features activities based on pets, printable worksheets and an extensive teacher`s section to help make this an invaluable classroom resource. This product is also part of The Learner's Library: Volume 2 money-saving compilation. 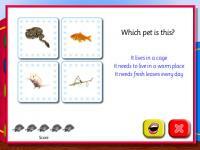 3 fun games are featured that are based on pets. 2 levels of text for different ages that is also fully narrated. Great for homework and out-of-school learning. Packed with photographs and video footage. 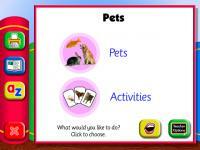 Children will love finding out about many different kinds of pets. To purchase, choose your licence type and click buy. 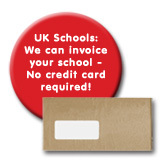 Remember, we can invoice UK schools even if you order online. PC: Pentium II 500mhz processor or greater, Microsoft Windows 98, 2000, XP or Vista, 128mb RAM, 16 bit colour. Mac: Power Mac G3 400mhz processor or greater, OS X (up to 10.4), 128mb RAM, 16 bit colour. Click here to view our latest software compatibility chart. The main menu provides access to the main information section, the activities, spoken glossary, scrapbook and teacher settings section. 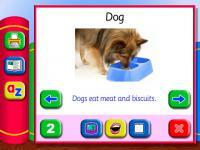 The browse menu splits the types of pet into categories for easy browsing. 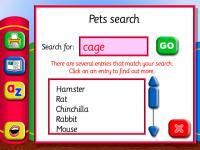 The user can also use an index or search facility to locate animals. The search facility allows you to quickly find information on the required topic. The index lists each topic in the product and is also useful for Literacy. Every pet and section featured in this title includes several pages of information, each fully narrated and with colour photographs. Text is provided at 2 different levels. Simple activities are also included with the title. 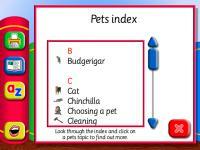 In this one the player must find the correct pet, by the description that is given.